I have vanity plates that read ILUV2OGLEOTS. Here’s a special Memorial Day OTS provided by vet’ Joe B in StL, a 1986 Schwinn Varsity. Sorry to have been away so long. But look what I found! 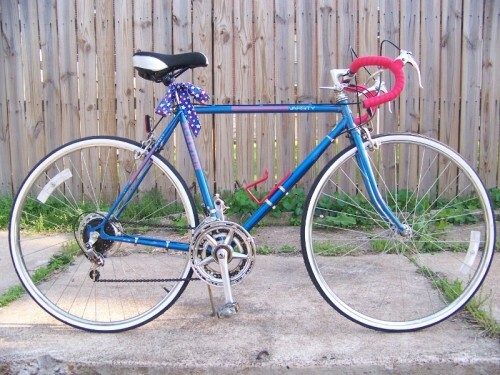 It’s a patriotic red, white & blue 1986 Schwinn Varsity – ironically made by Giant in Taiwan. I replaced the original torn black foam grips with Planet Bike Gel red tape. I also replaced to torn O.E. 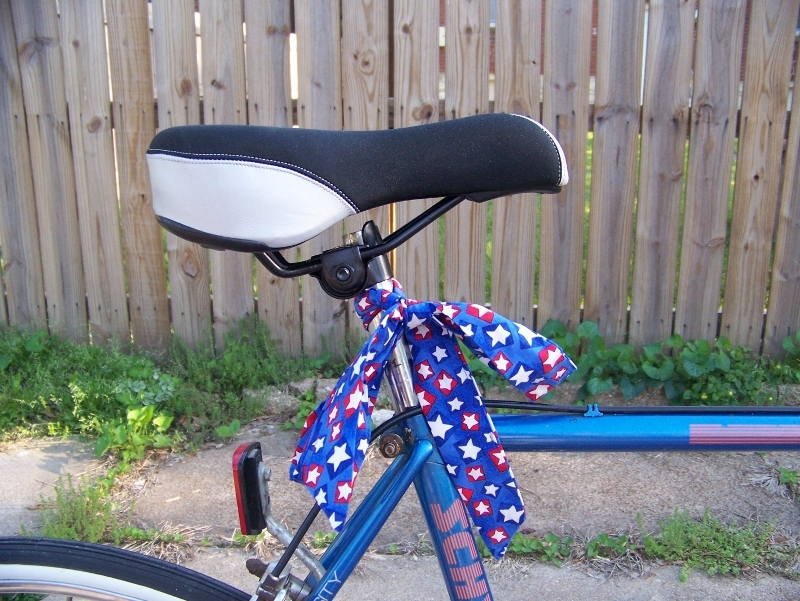 saddle with a Schwinn Ergonomic saddle, added pure white-wall tires and a red water bottle cage. I also like the fact it has a lugged frame. Here’s a surprise… I found a web page to the exact Schwinn catalog it was advertised in. 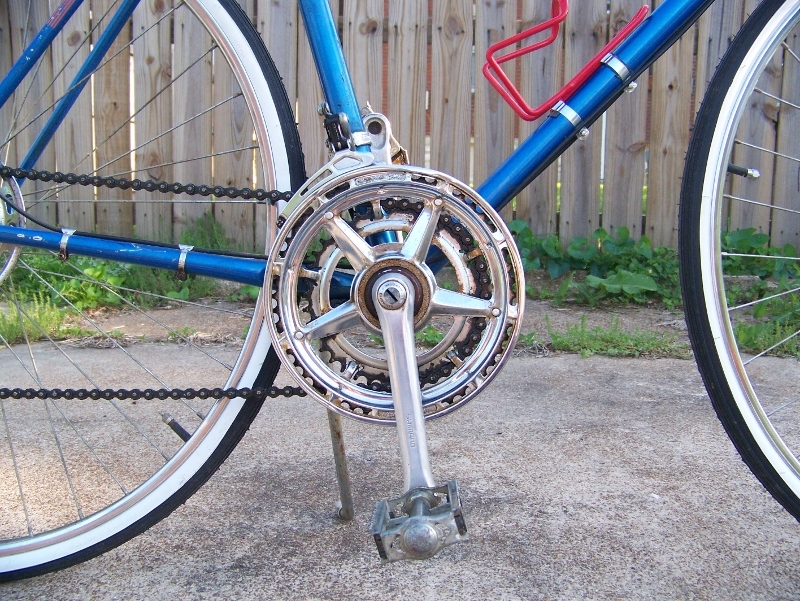 Shifting is done through a Shimano Positron 10 speed system…and it is smooth. Yes, it still has the original steel wheels – no rust. Why an ’86 would still have steel vs. alloy wheels is beyond me. I guess to keep cost down. I’ve always been jealous of Uncle Sam’s 1981 Schwinn Varsity. So, this is my own version of red, white & (cool) blue. You know, say what you will about steel rims – weight, non-existent wet braking – the suckers are just about bomb proof. Nice Varisty! Nice Varsity. Thanks for the Schwinn catalog link. 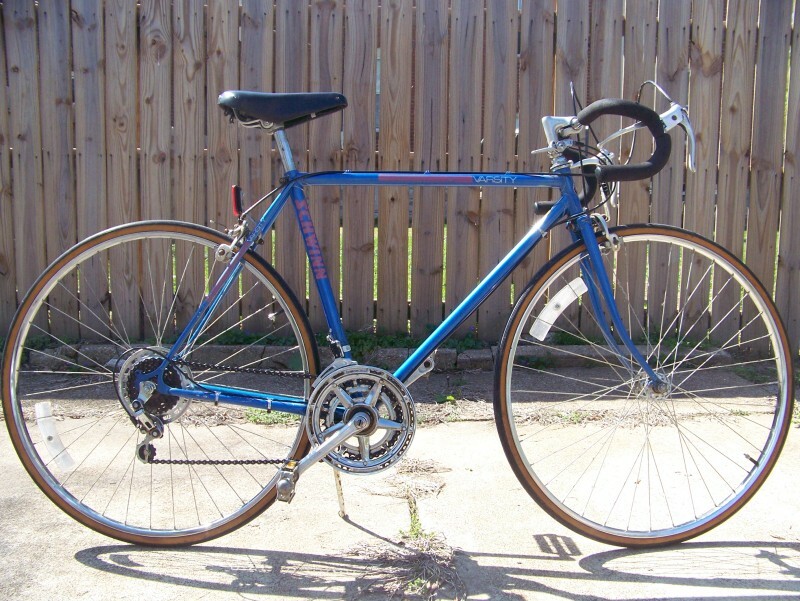 I’ve determined the Collegiate frame I found in a trash pile is an ’84 (also mfg by Giant). I’m working up a single speed now (since there were no wheels or deraillers or necessary details). Yep…FF system crank. The owner of my LBS just shook his head in disbelief. He called it one of the worst systems ever. Then he really flipped when I told him a kid drove almost 100 miles to buy it. I don’t keep them – I just refurbish & resell them. 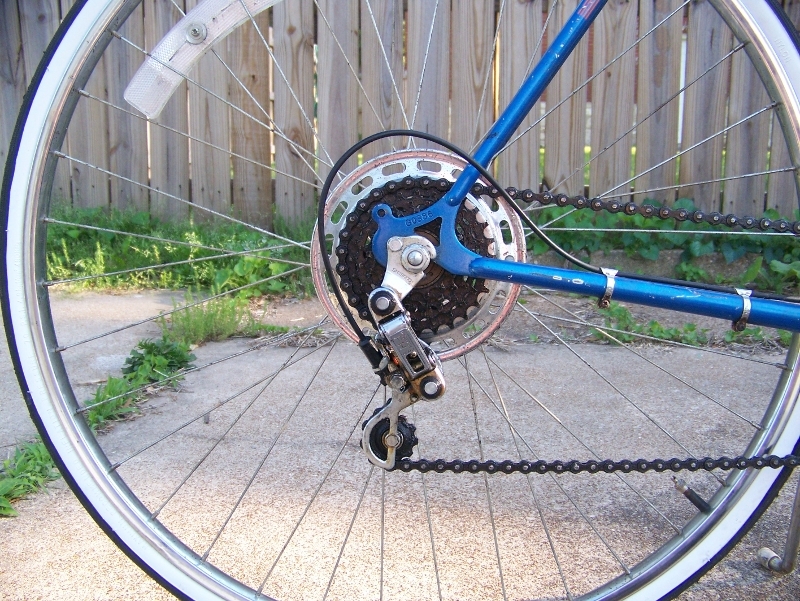 Back problems – I can’t ride that style bike without real pain. Need a hybrid. Thanks for your service to America, Joe! Good thing you didn’t lean a Louisville Slugger against it, lay a well-worn glove holding a baseball below it next to a pair of old Converse high-tops, or we’d probably go into patriotic nostalgia overload!